KATHMANDU, April 5: The cabinet meeting on Tuesday cancelled a foreign visit by two judges on the ground that the trip was not necessary. “We did not provide our consent for the study visit because it was not necessary,” Sher Bahadur Tamang, Minister for Law, Justice and Parliamentary Affairs, said at a press conference held following the cabinet meeting. Sources claimed that the visit proposal was forwarded for cabinet approval through the Ministry of Finance. 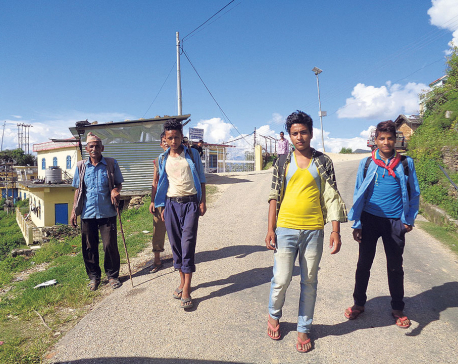 The visit team was to be led by an apex court justice and would include the chief judge of Tulsipur High Court, but the names of the judges were not forwarded. “The visit was related to a mediation observation program in Malaysia and Singapore,” a source claimed. Minister Tamang also clarified that the visit proposal was forwarded by the Ministry of Finance but without mentioning the names of the judges. He further clarified at the cabinet meeting that Acting Chief Justice Deepak Raj Joshee was not in favor of the visit. Sources claimed that Supreme Court Justice Tej Bahadur KC was supposed to lead the visit team. As Acting Chief Justice Joshee has been looking after the mediation committee at the Supreme Court, sources speculated that he might be in the visit program. The chief judge of Tulsipur High Court is Nahakul Subedi, who is a relative of former Chief Justice Gopal Parajuli. “The names for the visit were selected by then chief justice Gopal Parajuli, so he might have selected Subedi,” Tamang added. Supreme Court justices and lawyers have claimed that the cabinet decision may give room for attacking the independence of the judiciary in the days to come. “This is not good for the independence of the judiciary,” a justice of the apex court told Republica on condition of anonymity. According to him, there might be various types of visits but restriction of observation and study visits relating to capacity enhancement would adversely affect the independence of the judiciary. The justice also cited a provision in the Act Relating to Service Conditions, Remuneration and Facilities of Judges which guarantees judges a visit once in two years. According to him, it is mandatory for ministers, lawmakers and bureaucrats to get approval from the government prior to a foreign visit, but not for judges.